This paper presents an experimental investigation of short cold-formed lipped channel columns compressed between pinned ends. The short columns are subjected to pure axial compressive loading. Twelve column specimens are tested and the columns are categorised into three groups, depending on the length and thickness. The buckling modes of failure that occurred include local buckling and distortional buckling. A comparison of the experimental results with the loads predicted by the South African standard for the design of cold-formed steelwork (SANS 10162-2) shows that the code is not conservative enough to cater for these columns. Cold-formed lipped short columns are vulnerable to local or distortional buckling or both, because of the high width-to-thickness ratios of the web and/or flange. Local buckling occurs when the line junction of both corners does not change, with the adjoining lip, flange and web elements failing by plate flexure alone (Figure 1(a)). Distortional buckling occurs in thin-walled channel sections when the lip-stiffened flange of the section rotates about the flange-web junction. This usually occurs if the lip stiffener does not have enough stiffness to prevent the flange from rotating. The rotation can cause the flange to either move outward or inward depending on the nature of the load, supporting system or imperfections. At ultimate failure, both rotations can be accompanied by the bending of the web (Figures 1(b) and 1(c)). The wave length of this mode of failure is in most cases between that of local and overall member buckling, which makes it a practical member length. The study of the buckling failure modes for short cold-formed lipped sections dates to the 1940s. Initial work on these members was performed by Winter (1940; 1943). A summary of this work, including all the work done in the USA, is given by Winter (1949). In the UK, studies on thin-walled columns are summarised by Chilver (1951; 1953) and Harvey (1953). Chilver and Harvey's elastic plate buckling solution was based on the work of Timoshenko and Gere (1936). The work was extended by Lundquist and Stowell (1943), to enable stability methods to be applied in practice. It is worth noting that both Chiver and Harvey's methods of calculating the local buckling stress included the interaction of elements, which is common practice today. To ensure that local buckling (and not distortional buckling) occurs in lipped channels, Chiver suggested that the lip has to be stiff enough; however, no criteria for achieving this were given. This recognised that distortional buckling was a potential problem. The "effective width" aspect of the solution was based on work done by Von Kármán et al (1932) and modifications by Winter (1947). It is interesting to note that, after almost six decades of thin-walled column research, the work used today is still similar to Chilver's work. Distortional buckling was initially recognised during the 1960s, under many different names. Sharp (1966) analytically approximated the distortional buckling stress of aluminium lipped channels, and termed it "overall" buckling. Dwight's (1963) experiments were used to verify Sharp's results. Using the folded-plate method, Goldberg et al (1964) predicted the sectional distortion or distortional buckling of open sections under both compressive axial and bending load. Wittrick (1968a; 1968b) discovered distortional buckling modes (and called them torsional modes) during a study of stiffened panels in compression, using an exact stiffness method. In the work of Desmond (1977) and Desmond et al (1981a; 19881b), which formed the basis for the AISI (1996) specification on edge-stiffened elements, the term "stiffener" buckling describes the distortional mode. It was recognised that "stiffener" buckling occurred at a higher critical stress than local buckling. By providing a single empirical solution for the buckling coefficient k of an edge-stiffened element in either local or "stiffener" buckling, distortional buckling was treated as another local mode, and not explicitly different from local plate buckling. In order to increase the local buckling stress of slender webs of lipped channels, Thomasson (1978) introduced small groove stiffeners. This eliminated local buckling, but created what Thomasson called a "local-torsional" buckling, which is distortional buckling. To eliminate "local-torsional" buckling, closely spaced braces were attached from one lip to another. Once again the local mode became dominant. A finite strip method was developed by Sridharan (1982) to study distortional post-buckling behaviour, which he called "local-torsional" buckling. Using this method, a rapid increase in membrane stresses was found at the tips of the edgestiffening lips. Mulligan (1983), and Mulligan and Peköz (1984), observed distortional buckling during a local buckling study, and as suggested by Thomasson, also called the phenomena "local torsional" buckling. To restrict these phenomena, Mulligan provided braces in a manner similar to Thomasson. The need to investigate the behaviour of cold-formed steel storage rack columns at the University of Sydney led to work on distortional buckling (Hancock 1985; Lau & Hancock 1988). A hand method (Lau & Hancock 1987) for predicting the elastic distortional buckling stress, which used similar classic analytical techniques to Sharp (1966) but included web instability in the model, was developed. Further analysis and experiments were performed in which distortional buckling was the failure mechanism (Lau & Hancock 1990). In Japan, Hikosaka et al (1987), and Takahashi (1988) conducted research to predict distortional buckling of thin-walled members with polygonal cross section. Rasmussen and Hancock (1991) showed the importance of different end fixity on distortional post-buckling behaviour. Kwon and Hancock (1992) performed experiments on lipped channels with and without groove stiffeners in the web in which the distortional mode was unrestricted. 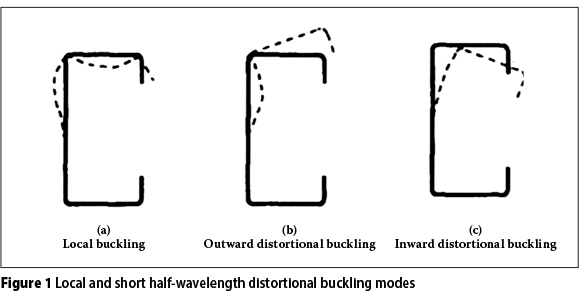 These tests showed that interaction of distortional buckling with other modes is weak (supported by Young & Rasmussen 1998, 1999; Davies & Jiang 1998) and that distortional buckling has lower post-buckling capacity than local buckling (Schafer 1997). Eurocode 3 (EN 3 1996) provided a method for predicting the distortional buckling of cold-formed lipped channels. Yang and Hancock (2004) observed a significant increase in post-buckling strength when the flanges of carbon steel sections with intermediate stiffeners moved away from the centroid, compared to those specimens which had inward movement. Lecce and Rasmussen (2005; 2006) investigated distortional-buckling cold-formed stainless steel sections with intermediate stiffeners. Although the specimens were identical, distortional buckling caused the flanges of some specimens to move away from the geometric centroid of the section, whereas the flanges of others moved in towards the centroid. Inward or outward deformations may have been caused by imperfections. Specimens that failed by outward movement of the flanges maintained the ultimate load over a greater vertical displacement, thus producing a more ductile failure. In the extensive studies by Prola and Camotim (2002), and Silvestre and Camotim (2004; 2006), based on the Generalised Beam Theory (popularly known as GBT), it was found that the distortional post-buckling strength of a simple lipped channel made from conventional carbon steel was higher if the flanges move towards each other (inwards) than if flanges move away from each other (outwards). However, for lipped channels with intermediate stiffeners the post-buckling strength was higher if the flanges move away from each other, as observed by Yang and Hancock (2004). Silvestre and Camotim (2006) observed that for inward flange-lip movement, the stiffener develops high compression, which destabilises the web and is largely responsible for the less stiff post-buckling response. Research about short cold-formed lipped channel sections is still being undertaken to better understand their behaviour (bucking failure modes) and strength characteristics. The aims of this paper are to investigate the behaviour (buckling-failure modes) and the strength (load-carrying capacity) of short cold-formed lipped channel sections. According to Ziemian (2010), a short column is defined as a member that is sufficiently short so as to preclude member buckling when compressed, but sufficiently long to contain the same initial residual stress pattern as a much longer member cut from the same stock. For cold-formed steel sections, the stub-column length should be sufficiently long to exhibit local buckling, as well as the effect of cold-forming on the column performance. The length of cold-formed stub columns should not be less than three times the largest dimension of the cross section, and no more than 20 times the least radiusof-gyration. The cold-formed lipped sections tested are given in Table 1, and all do not comply with the length provisions for a short column, as defined by Ziemian (2010). 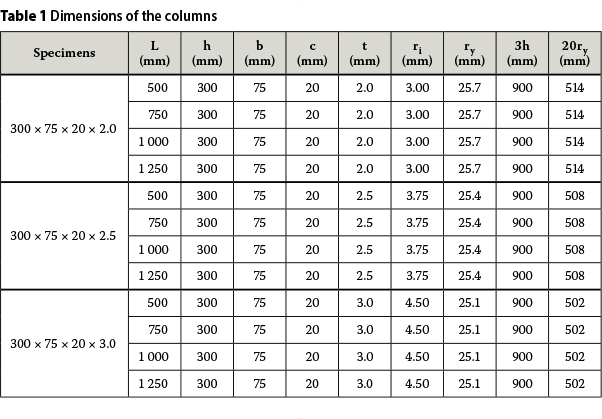 In this table L is the length of the sub-column, h is the depth, b is the width, c is the size of the lip, t is the thickness, ri is the internal radius and ry is the minimum radius of gyration of the section. To cover a wider range of lengths it was decided to test four specimens of each section size. The material properties of the cold-formed column sections were determined from coupon tests. Three longitudinal coupons were cut from the web to establish the yield stress, ultimate stress, elastic modulus and the elongation of the materials. The coupons were prepared and tested according to the British Standard, BS 18. A 1195 Instron testing machine with an ultimate capacity of 100 kN was used to test the coupons. The tensile load was applied at a low rate of 3 mm/min. A calibrated extensometer was used to measure the strain. The material properties are shown in Table 2. In this table fu is the 0.2% proof yield strength, fy is the ultimate strength, E is the elastic modulus and eu is the strain at fracture based on a gauge length of 50 mm. These values were established from stress-strain curves obtained from coupon tests. The 0.2% yield strengths were used to calculate the code-predicted strengths of the columns. Twelve short columns were tested under pure axial compressive loading to establish their compressive resistance strengths and failure modes. The specimens were delivered by the manufacturer in lengths of 6 m. Each specimen was cut to a specified column length using an electric saw. The ends of the columns were machined flat and the load was applied at the centroid (Figure 2(b)). As shown in the schematic experimental set-up, shown in Figure 2(a), the load was applied through two thick plates with grooves to accommodate a spherical ball, so as to simulate a pin. Thick plates ensured the uniform spread of the load throughout the entire cross-sectional area of the column. Figure 2(c) and Figure 2(d) show the top and bottom end conditions of the set-up. A Moog testing machine with an ultimate capacity of 2 000 kN was used for the experimental test. To allow gradual failure of the columns, the load was applied at a rate of 2 mm/min. The testing machine measured the axial compressive load and displacement. The experimental compressive resistance (NEX), gross yield compressive resistance (NY = Agfy), effective yield compressive resistance (NEY = Aefy) and the buckling compressive resistance (NC = Aefn) are given in Table 3. The effective area (Ae) is determined using the effective width method, where the channel lips area, the flanges area and the web area of the column are analysed separately. NEY and NC are calculated using the stress conditions of f = fy and f = fu, respectively, where fn is buckling critical stress. The predicted resistance values are obtained using the South African code, SANS 10162-2. This code is based on the Australian code AS/NZS 4600. Table 3 shows that there is not much difference between the experimental compressive resistances of the chosen lengths of each specimen. This implies that all lengths of columns can be classified as short. If this is the case then it is not appropriate to use the length suggested by Ziemian (2010) for cold formed sections. In order to classify the length of these sections it is proposed to adopt the length classification for hot-rolled stub columns. According to this classification, the length of hot-rolled stub columns should not be less than (2d + 250 mm) or 3d, whichever is smaller, and not greater than 20ry or 5d, whichever is larger, where d is the depth of the shape and ry is radiusof-gyration about the minor axis (Ziemian 2010). This classification is wide enough to accommodate these sections. 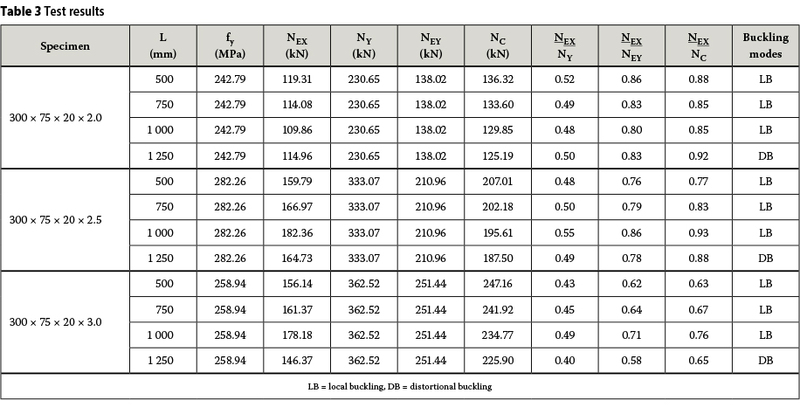 Table 3 also shows the experimental buckling resistance to be almost 50% of the gross-sectional yield resistance for the 300x75x20x2.0 and 300x75x20x2.5 specimens. This percentage reduces to about 45% for the 300x75x20x3.0 specimens. This huge decrease in resistance clearly shows the importance of considering local and distortional buckling in such members. It is well known that the main effect of local buckling is to cause a redistribution of the longitudinal stress so that the greatest portion of the load is carried by the corners and its adjacent areas. This situation increases the compressed stresses in and around the plate junctions, and high bending or flexure stresses in the flat portions, resulting in capacities that are well below the squash load of the section. The effect is also seen in the corresponding effective yield and the buckling resistances. The difference in column strength between the sections tested is as a result of the different thickness, yield strengths and the magnitude of the residual stresses. A clear trend can be seen here: the ratio of the experimental strength to the predicted strength decreases with increase in thickness of the specimen. Residual stresses tend to affect thicker sections and are responsible for the lower strength ratio of the 300x75x20x3.0 specimens. Another confirmation that the tested columns are actually short, is the fact that the effective yield resistance and the buckling resistance are almost the same. 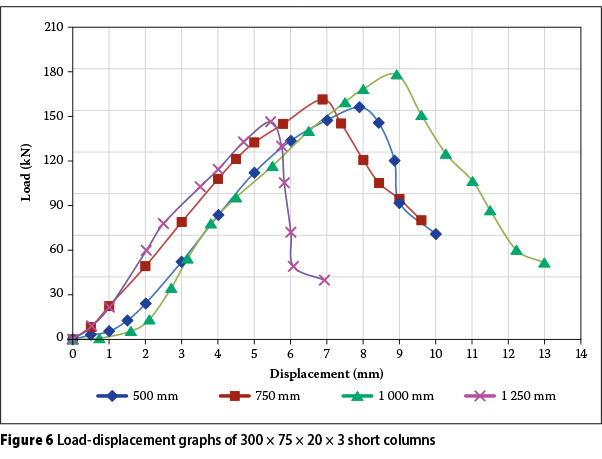 A comparison of the test results and calculated un-factored resistances shows that the SANS 10162-2 specification and its related specification (AS/NZS 4600) overestimate the compressive strengths of short cold-formed lipped channel columns. The standards are based on Winter's (1947) post-buckling equation, and all specimens tested did not show post-buckling behaviour. On average the test loads for the 300x75x20x2.0, 300x75x20x2.5 and 300x75x20x3.0 specimens are 85%, 83% and 66% of the effective squash or buckling loads predicted by SANS 10162-2 respectively. In the 300x75x20x3, the average difference between the test results and the code predicted strength is 34%. The largest cause of this low resistance is local buckling and distortional buckling. Local buckling occurred at the end of the column in the 500 mm, 750 mm, and 1 000 mm tests and may have been initiated by increased cross-section distortions and initial geometric imperfections caused by the cutting process of these sections. Although no measurements of these imperfections are given in this paper, the author noticed that the flange-lip junction moved outward even before the sections were tested. Lam et al (2006) has shown that the compressive capacity and modes of failure of lipped stub channels are very sensitive to the magnitude and distribution of the initial geometric imperfections. 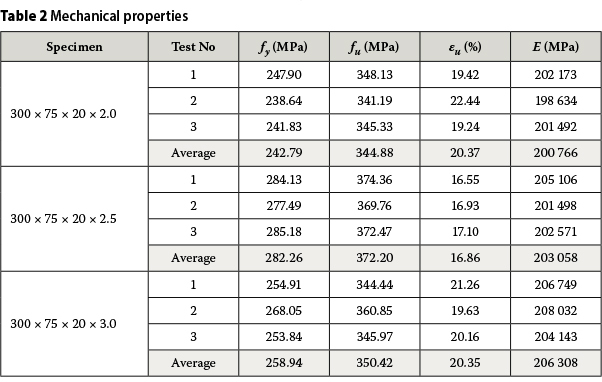 In this investigation, the compressive strength of ten fixed-ended steel stub columns, manufactured from 150x65x13x1.6 mm and 100x50x10x1.6 mm cold-formed lipped channels, were found to be 75% and 77% of the strengths predicted by the British standard (BS 5950-5) respectively. This reduced resistance was influenced by cross-section distortions and initial geometrical imperfections, caused by the cutting process. In a previous study, Wang et al (2006) showed that, although the imperfections occurred in all the flat portions of the section, they were significant in the flanges. Cutting had little or no effect at the web-flange corner. The effect of cross-section distortions and initial geometrical imperfections was made worse by the pinned boundary conditions chosen in this set-up. In singly symmetric cross-sections with pinned ends, Rhodes and Harvey (1977), and Young and Rasmussen (1998; 1999) have shown that the redistribution of longitudinal stresses caused by local buckling also produces a shift of the line of action of the internal force or effective centroid. The shift induces overall bending, which significantly reduces the column strength. In this paper the load was applied through the geometric centroid, whereas the specifications assume concentric loading to be at the centroid of the effective cross section. This means that the buckled member now behaves as a beam-column, in which the applied moment is calculated as a product of the axial force and its eccentricity, where the eccentricity is the distance from the effective centroid to the geometric centroid. The effective centroid is determined from the effective cross section, calculated from the effective widths of each plate. Another possible cause of the substantial low ratios of test versus predicted strengths might be the size of the lip. Specimens with a smaller effective lip size resist less load than those with a larger lip size (Kwon & Hancock 1992). Kwon and Hancock (1992) also found the maximum stresses in small-sized lipped channel sections to range from 25% to 34% of the yield stress. Two buckling modes of failure were observed from the experimental tests, namely local and distortional buckling. Local buckling (LB) occurs when parts or portions of the section elements yield before the actual yielding of the member is achieved, and was observed in very short columns (typically in lengths of 500 mm to 1 000 mm) (Figures 9(a) and 9(b)). The local buckling failure mode of these columns was more excessive at the ends of the columns, and caused the web to buckle outwards towards the shear centre of the members. This failure mode is more distinct in thinner sections and the buckle of these sections seems to cover a larger area of the web than thicker sections. As indicated above, the process of cutting cold-formed steel sections to form a stub column may have led to cross-section distortion and initial geometric imperfection. Distortional buckling (DB), also known as "stiffener buckling", is a mode characterised by rotation of the flange at the flange/web junction in members with edge-stiffened elements (Schafer & Peköz 1998). Distortional buckling was observed in 1 250 mm length columns. Figure 3(d) shows evidence of distortional buckling. In this case distortional buckling is characterised by the closing up of the two flanges. This mode of failure is probably unsymmetrical, because the section was distorted during the cutting process (Lam et al 2006). The experimental load-displacement graphs for the three different sections are shown in Figure 4. The graphs are linear-elastic up to the maximum load and there is little or no evidence of inelastic behaviour. 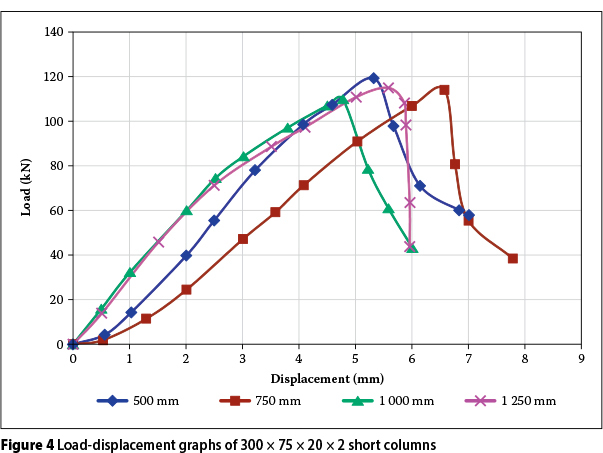 For the 300x75x20x2 specimens, the load-axial shortening curves experience abrupt drops immediately after the ultimate loads, while for specimens 300x75x20x2.5 and 300x75x20x3.0 the load-axial shortening curve follows a smooth decrease of loads at the post-ultimate range (Figures 4 and 5). The abrupt drops correspond to the sudden collapse of the columns in the tests. Generally, columns with larger thickness experience less abrupt drops in load immediately after the ultimate load, compared with thinner sections. 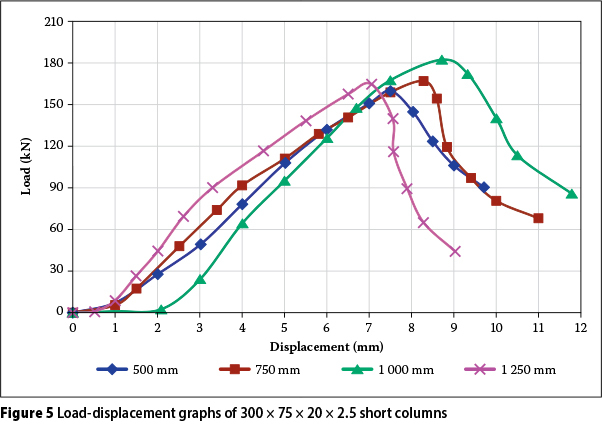 Ziemian's (2010) suggested length for short columns does not apply to the tested sections; however, the sections can be classified as short, considering that there is little or no variation in the test strength achieved between the different lengths. Columns with length ranging from 500 mm to 1 000 mm failed by local buckling of the web, whilst the 1 250 mm column length failed by distortional buckling. The ultimate compressive resistance obtained from the test results ranged from 66% to 85% of the compressive resistance, calculated based on SANS 10162-2 and its related specifications. This implies that the design-predicted strengths by the SANS 10162-2 specification generally overestimated (not conservatively) the design compressive strengths of the short cold-formed lipped channel columns. The predicted strengths for the 300x75x20x3 mm columns are much larger than the test strength. This huge difference is caused by the fact that the lips for these sections are all fully effective in resisting local buckling. Local buckling reduced the effectiveness of the lips of the 300x75x20x2 mm and 300x75x20x2.5 mm column sections. Local buckling in the web and the resulting low strength of the lipped channels may have been caused by the increased cross-section distortion and initial geometric imperfections caused by the cutting process of these sections. Before the tests were performed, it was noticed that the flangelip junction had moved outward. Lam et al (2006) has shown that the compressive capacity and modes of failure of lipped stub channels are very sensitive to the magnitude and distribution of the initial geometric imperfection. Although the imperfections occurred in all the flat portions of the section, they were significant in the flanges (Wang et al 2006). Cutting had little or no effect at the web-flange corner. Further, SANS 10162-2 and its related specifications (AISI S100-12 and AS/NZS 4600) are based on Winter's (1947) post-buckling equation. The equation assumes that post-buckling strength will develop in the web and flange. No post-buckling behaviour was shown by all the specimens tested in this paper. The pinned boundary conditions chosen in this set-up did not make the situation any better. It has been shown by Rhodes and Harvey (1977), and Young and Rasmussen (1998; 1999) that in singly symmetric cross-sections with pinned ends, the redistribution of longitudinal stresses caused by local buckling shifts the line of action of the internal force or effective centroid. The shift introduces a moment, which significantly reduces the column strength. Since the load was applied at the geometric centroid, the eccentricity is the distance from the effective centroid (determined using the effective width method) to the geometric centroid. The author wishes to acknowledge Nhlanhla Tshabalala, a final-year Civil Engineering student, who assisted in carrying out the tests reported in this paper, and the University of Johannesburg Research Committee (URC) for sponsoring this research. PROF MORGAN DUNDU is the Head of School of Civil Engineering and the Built Environment at the University of Johannesburg. He holds a BSc (Eng) degree from the University of Zimbabwe, and an MSc and PhD in Structural Engineering from the University of the Witwatersrand. He is a member of the American Society of Civil Engineers (ASCE), an editorial board member of the Journal of Steel Construction: Design and Research, a member of the European Convention of Constructional Steelwork (ECCS), a member of the International Association of Bridge and Structural Engineering (IABSE), and a member of the Standards Association of South Africa (SASA).